*Regular nightly rate is $239. Weekly rate is stay for 7, pay for 6. Your reservation total will include a cleaning fee and bed tax in addition to the rental rate. Location, Location, Location! 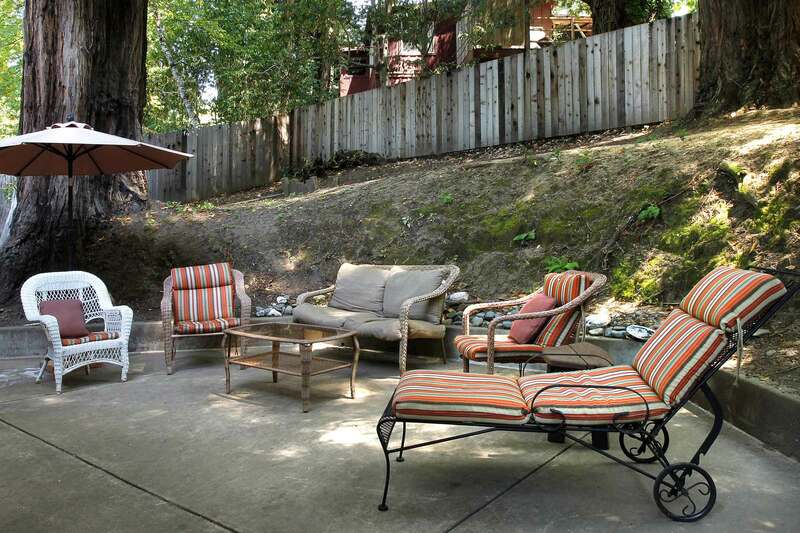 Contemporary Home with Traditional River Touches on Forested Hillside, Woodstove, Remodeled Kitchen, Hot Tub, Fenced Yard; Easy Walk to Everything Downtown Guerneville, Riverlands Pier, Pee Wee Golf, Tennis/Basketball Courts, and Playground. Wi-Fi, Landline Phone, Cable TV. Keyless Entry. Your Well-Behaved Dog is Welcome! Blue Jay's main living level is up a couple of flights of stairs. The living room, dining area, and kitchen open to each other in an "L." Off the living area, there's one bedroom and bathroom. Down a set of stairs,* there's a large bedroom and another bathroom. The third bedroom is a detached satellite room (no bathroom), a few steps away from the front door. 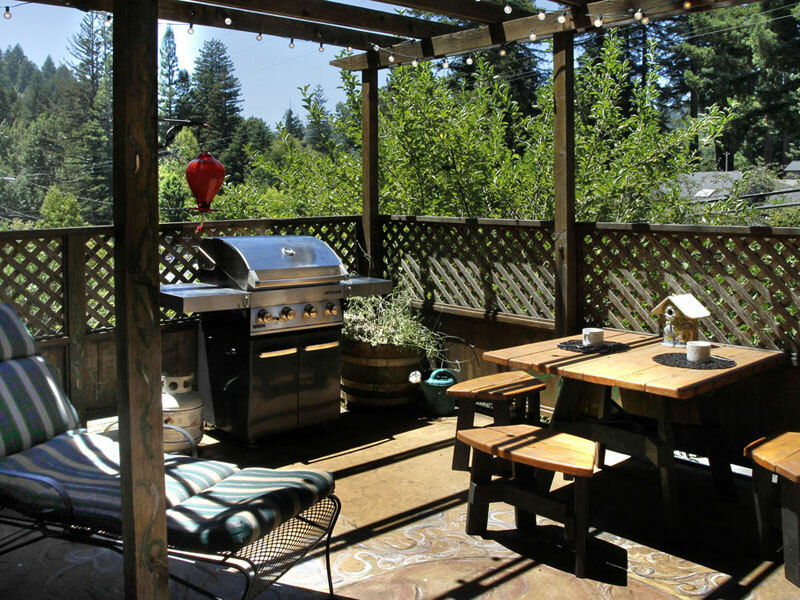 Off the living room, at the front of the house, there's a deck with outdoor dining and gas grill. 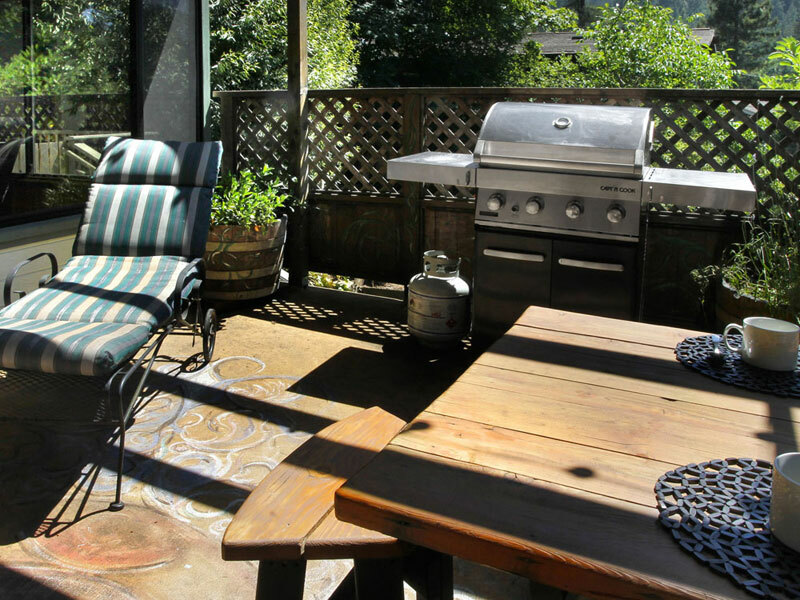 Off the kitchen/dining area, at the back of the house, there's a patio with outdoor dining and charcoal BBQ. 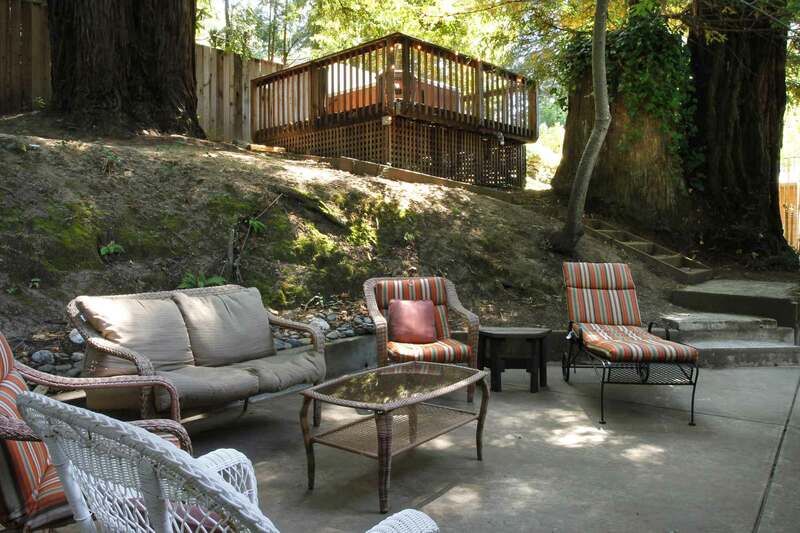 Beyond the patio, up the hill, there's wooded hillside and a deck with hot tub. The rear yard is fully fenced. House is approx. 1340sf. *Please note: The steps to the lower level are narrow and steep with low clearance; there is a gate at the top. Please bring your own spa/beach towels, toiletries and firewood. "The experience was overall good"
This spot is close to town, with three separate bedrooms (one being an unattached small shed/room). The experience was overall good, besides the moldy/damp odor in the unattached room and the basement. The hot tub was nice! "easy access to the place"
Really easy access to the place and communication/instructions were great! "We had a great visit." It was great having a quaint/relaxing place for the 6 of us. Our days were busy and full, so it was nice to end the day at the Blue Jay. Thank you! We had a great visit. "It’s a great place for family’s "
It’s a great place for family’s very quiet area not to far of a drive to bodega bay very convenient not what I expected it to be . "This was a perfect home base for our girls' weekend!" This was a perfect home base for our girls' weekend! The house was just the right size for our group of six, with a bit of room to spare. The kitchen had tons of counter space so several of us had plenty of room to hang out and cook together, and gathering around the cozy fireplace each evening was a treat! 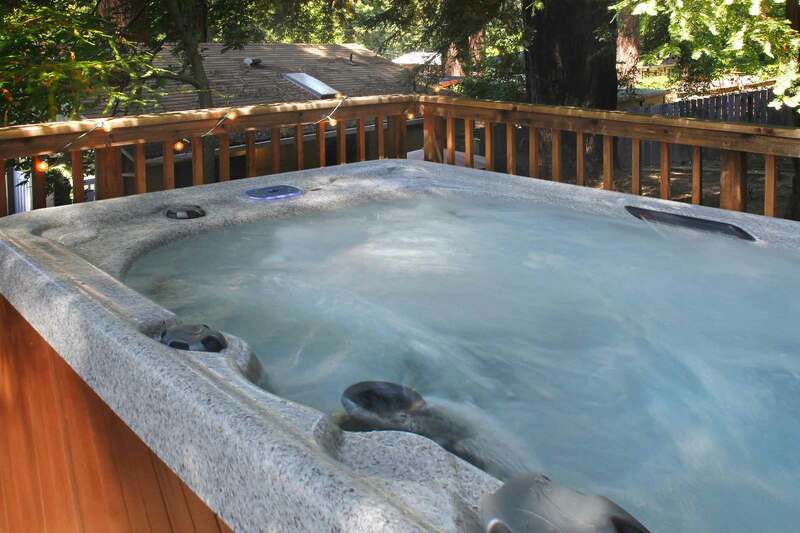 The hot tub under the redwood trees is beautiful and a great place to relax. The fenced in yard was great for my little dog, who had a fantastic time exploring. One of the reasons we chose this listing was its wildly convenient location. The small, quaint town is a super short drive (or really reasonable walk) away. We forgot to pick up a few supplies and it was really easy to jet over to Safeway. We were also able to check out Armstrong Redwood Forest and a few wineries within a short drive. Everything in the house was sparkling clean and the hosts were the most accessible people I have ever communicated with. They responded to all questions almost immediately, which was really appreciated since our trip was a bit last-minute. I would definitely recommend this property and management company to other guests. Two tips to share: First, if you come in the winter, I would recommend following the hosts' tip to arrive while it's still light. The house is easy to find, but it takes a couple of hours to start the fire and for the heaters to warm the space. Since we arrived late, our first night was a bit chilly. The rest of the time was fantastic and cozy! Second, you may wish to bring your own small pots and pans if you plan to do a lot of cooking. We were able to use the supplied ones, but the nonstick coating was really worn. (Some people have commented that the pots and pans aren't clean - this isn't accurate; they've just seen better days.) 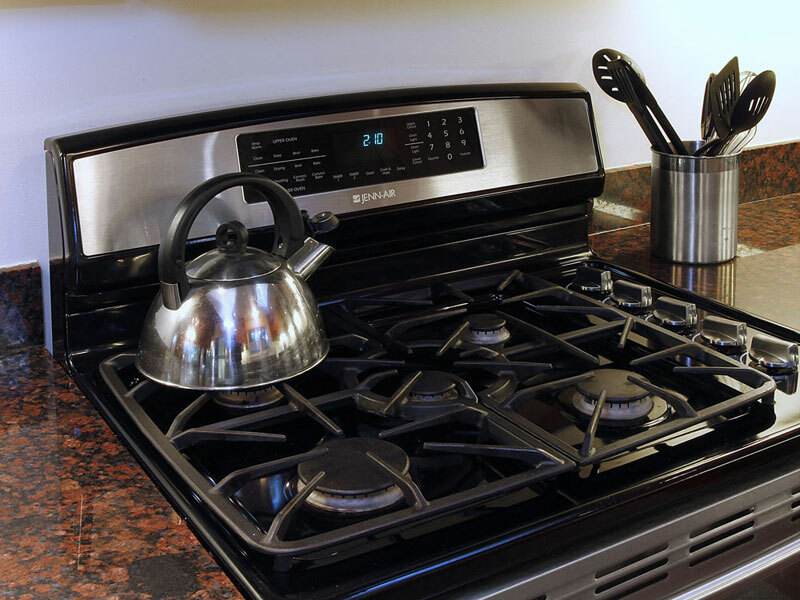 Other than the pots and pans, it's the best equipped kitchen I've experienced yet, so don't let that hold you back! It's a good value. Probably the highlight for us was the wood burning stove. Although it was challenging for us to figure out how to use it at first and the instructions seemed to be missing. But eventually we figured it out. "Grateful to be close to downtown!" Grateful to be close to downtown! 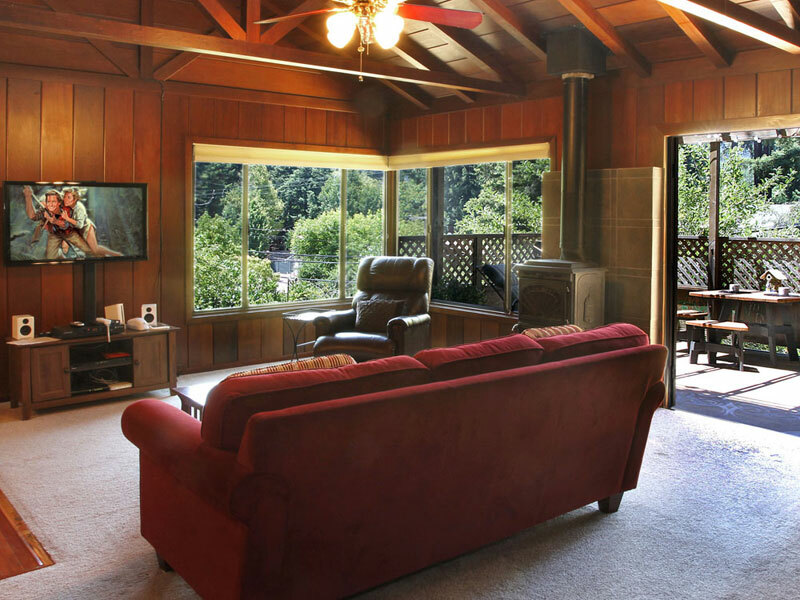 "We enjoyed our Christmas getaway"
This location is a great launching point for exploring the cute town of Guerneville and other attractions in Sonoma County. The second queen bed in the "back house" makes for easy sleeping arrangements and it is only a few steps from the front door. 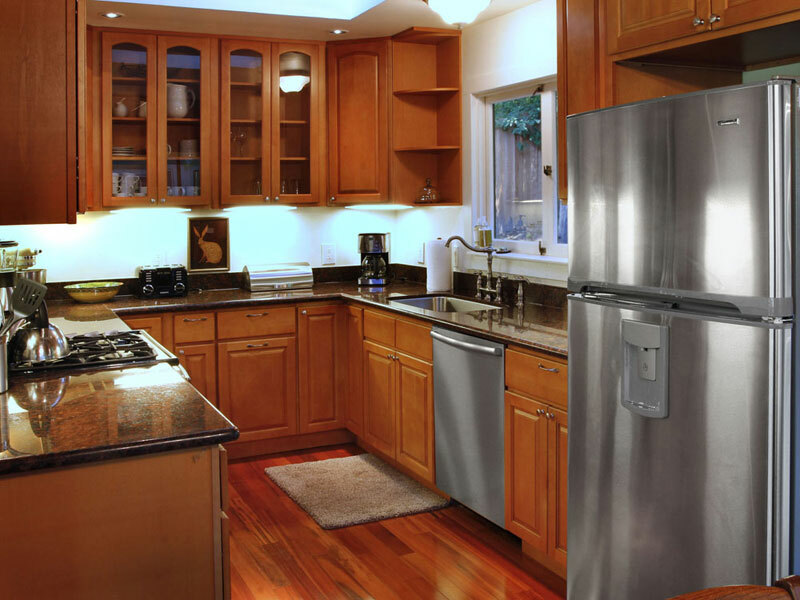 The other appliances and amenities offered at the house make it a great option for hosting friends and family for a big meal or holiday. We enjoyed our Christmas getaway in Guerneville! "Overall good value and clean." Cool house just across the pedestrian bridge from downtown Guerneville. 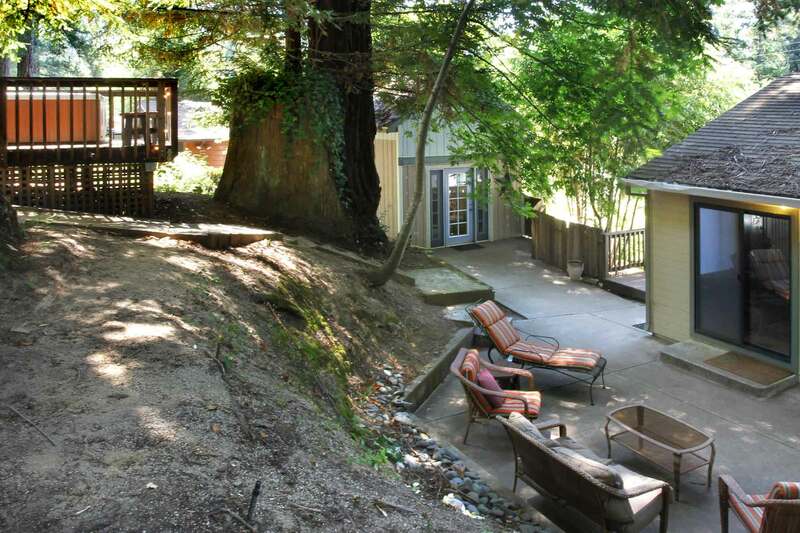 Great back yard with redwood trees coming out of the hill and hot tub up top. Good amount of space for the dog to run around Living room, kitchen and master bedroom are pretty nice, downstairs is a bit funky (staircase / low ceilings) but has more space for sleeping and a second bathroom / laundry. We did not use the separate bedroom in a shed-type building, which could be good for a couple (no bathroom though). If you want to be close to the town center, this is a perfect option, though the walk isn't great due to a busy street and a sketch park, but the pedestrian bridge is right there close by. Overall good value and clean. Make sure you take blankets to compensate heating issues in winter. Ask them to fix downstairs tv and full bed before your vacation! The location is prime. it is in the heart of wine tastings for vineyards along the Russian River Valley. It is also very close (walking distance) to the town. The town has a large supermarket and other stores that help complete your stay. Cozy, clean and comfy. We had a wonderful weekend here. We will definitely come back. 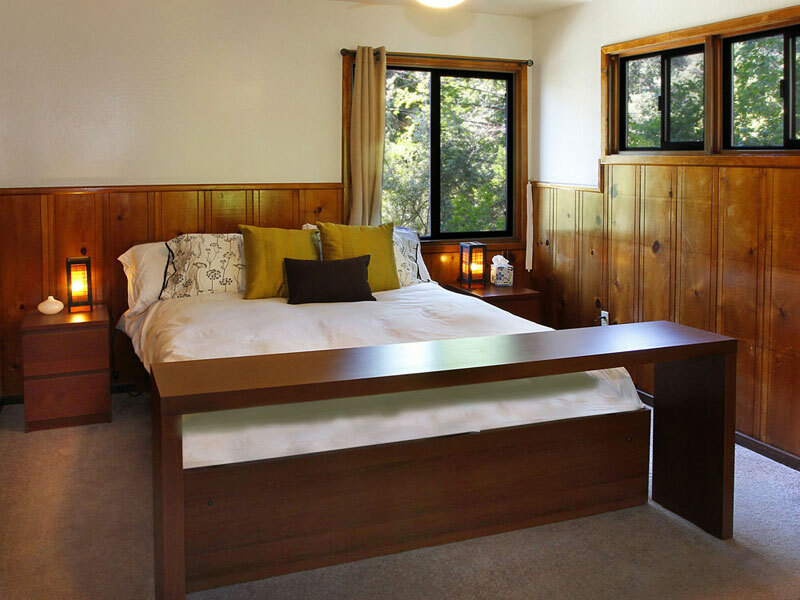 "This is a fantastic spot"
This is a fantastic spot with everything you need for a great stay at the Russian River. Tons of space, indoors and outside. Hot tub and BBQ in perfect working order. Five minute walk to Guerneville and Johnson’s Beach. The host allowed our group to have a late checkout at a minute’s notice which was awesome. Would stay here again and highly recommend it. "This location is pretty amazing. " This location is pretty amazing. The walk to downtown, bridge over the river, was enjoyable and very short! There is a small park only a few houses down, which is great for kids! This house is pet friendly and people without pets should note this when booking. Lot's of room for everyone to sleep comfortably. Hot tub is always awesome. Beautiful kitchen with everything you might need including a waffle maker! "A great hideaway in the trees! " A great hideaway in the trees! The guesthouse is adorable and the kitchen wonderful for a cook. Outdoor living space was awesome! The kitchen and hot tub where nice some of the furniture needed updating. The location was great with a view of fireworks from the deck. This is a very welcoming home in a great location! 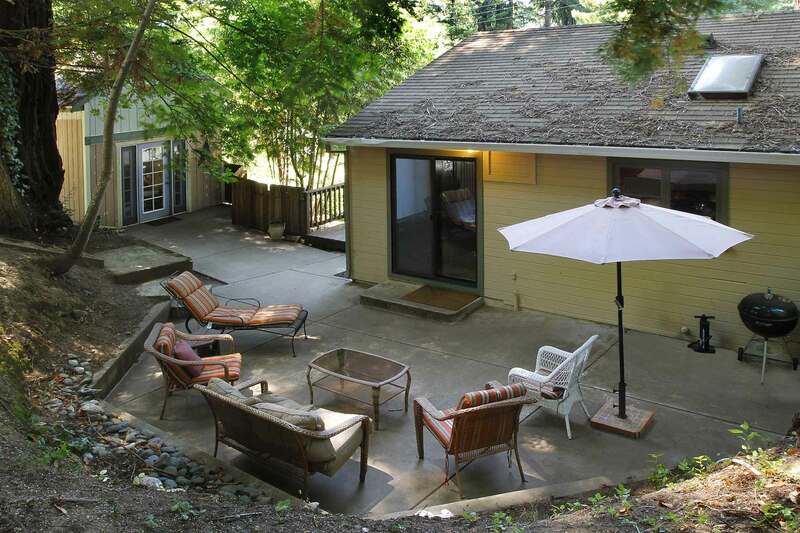 Easy walking access to Guerneville shops but away from the weekend crowds. The backyard and hot tub were lovely and we appreciated that the kitchen was well stocked. The steps to the downstairs bedroom/bathroom/laundry are STEEP but a gate is provided for safety. Would definitely return. The place is accurately described and is only a 5 min walk to downtown. The downstairs dorm room fits 5 people (1 couple plus 3 singles) but is a bit cold and not fancy. The house is quite comfortable and would recommend. Great location. Nice amenities. Even though house is non-smoking, it smelled like cigarettes when we arrived. Bathroom can use some updating. 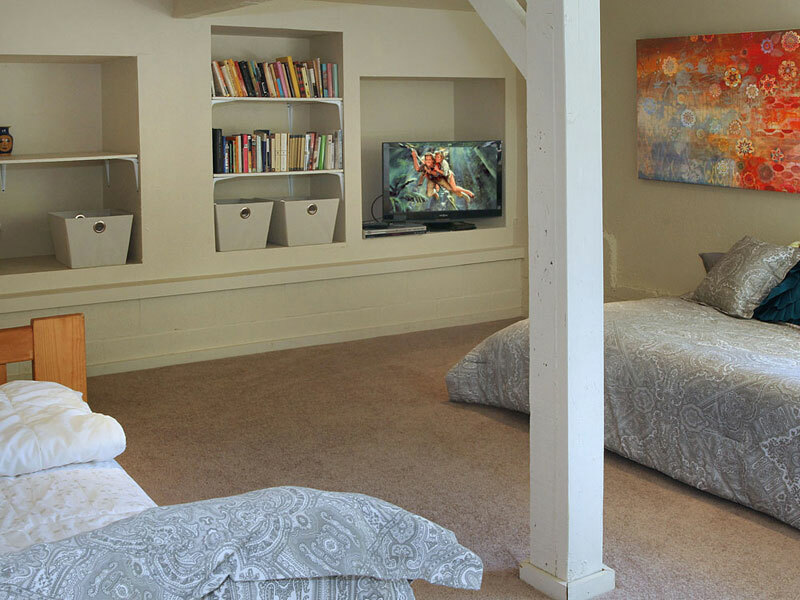 Lower level quarters would suit children better than adults. Overall it was a nice, quet neighborhood and we had a good time. Short walk to town, this lovely home gave my friends and me a great base to explore Armstrong State Park, the culinary delights of Guerneville, and a place to hang out and rest. In the winter, the basement gets cold but a heater is able to keep away the chills. 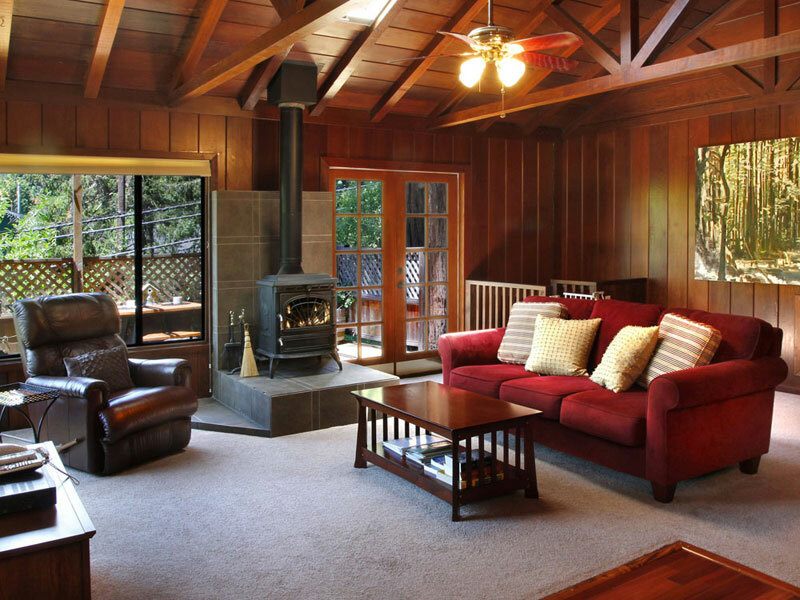 We enjoyed the cozy living room wood stove & beautiful warm wood interior. Walked over the historic foot bridge to Main Street for dinner. Hot tub was fantastic. Lovely stay! The house at River Getaways was exactly as described. It was nicely furnished, clean and comfortable. We thoroughly enjoyed the hot tub, the nearby playground and the easy walk to town. Entry was easy and they had a thorough house manual that guided us through the use of the place. Would happily stay there again. Great spot! Our kids loved the park down the street and the hot tub! "Blue Jay Hideaway Just the Right Size"
Our family of 5 adults was comfortable, giving us space to be together and to separate for alone time on our long weekend. The Labor Day weekend was the hottest ever in Guerneville from what we heard and we were glad we brought another fan for the house. It did cool down at night which helped greatly. The kitchen was beautifully stocked in every way and the back patio was a lovely place to spend time together. Our married children loved the little outside bedroom--great addition to the property. Wifi was perfect. Thank you for a great getaway in an interesting area. Great restaurants were not difficult to find. "Really great location and cozy home!" We enjoyed our stay. 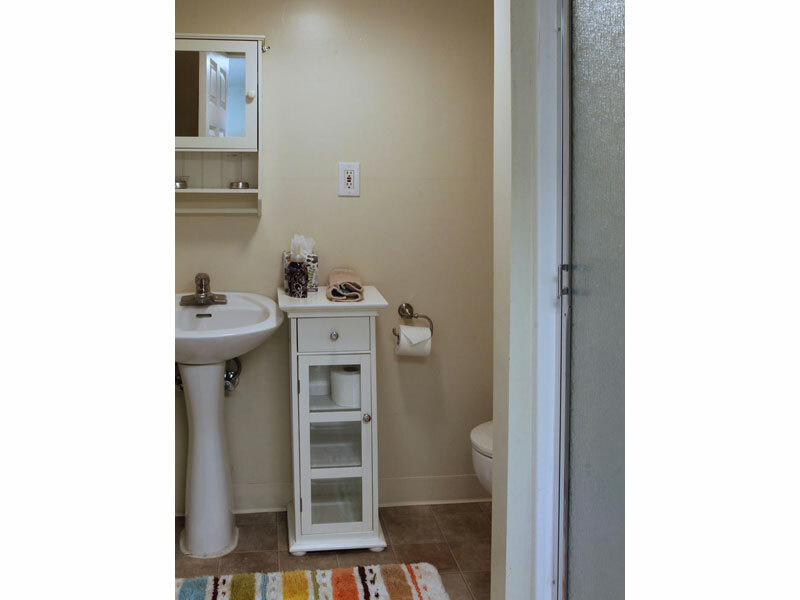 Close proximity to town, Johnson's Beach, mini golf and park. Ideal for our family with older independent kids. The steep, narrow staircase was mentioned in previous reviews, but was not an issue for our 12 and 17 year old boys who stayed downstairs. Yard is steep, but again with older kids, not an issue. Would have been nice to have more kitchen towels handy and an oven mitt, but otherwise kitchen was stocked well. We had a very nice time. "Comfortable house with a great location..."
Comfortable house with a great location that is an easy walk to town. I'd definitely stay here again. Overall, this is a nice property. A little dated, but comfortable. The kitchen was small but had newer appliances that were nice and a well stocked spice cabinet so we had everything we needed to prepare the meals we had. The bed in the upstairs room was a little too soft for me, and one of the twin beds downstairs was pretty lumpy, but the other one was good. We did not use the extra bedroom so I can't speak to that bed. The patio outside was a great place to sit in the afternoons. I loved all the big trees! I didn't realize that there was no air conditioning when I booked the house, so it did get a little warm in there in the afternoons. There were several fans and keeping the blinds closed helped keep it a bit cooler. I imagine it doesn't usually get real hot there, but it was pretty warm when we went. Very close to town and the river which was nice. 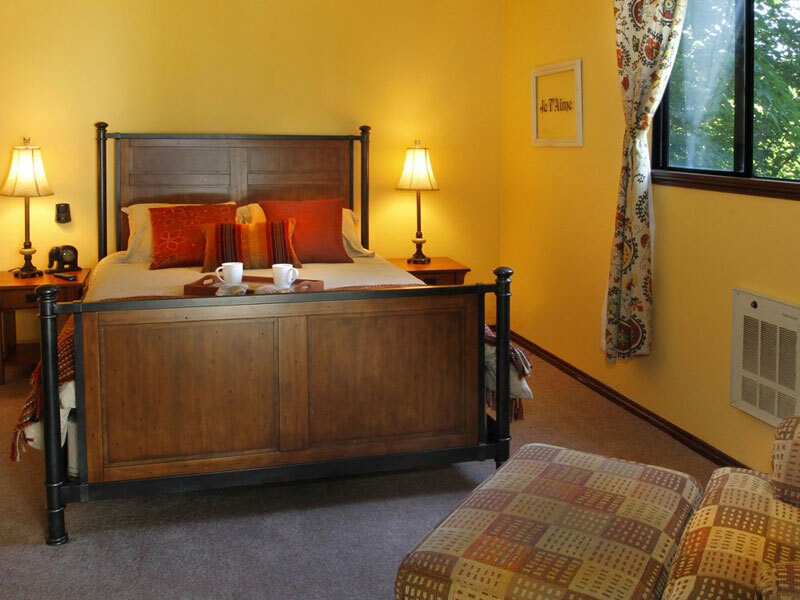 "Overall a decent stay...but a little misleading." Our stay at Blue Jay Hideaway was, for the most part, okay. The house was well equipped and had a great location, just a few minute walk to town. It was a little outdated but it had a cozy, cabin-like feel. When we arrived our first surprise was with the downstairs bedroom. We knew it had two twin beds (one of which was a trundle bed, not advertised but a nice touch!) and a futon. What we didn't know is that the stairs leading to it were tiny and once you forced your way down them the clearance was no more than 5'10". The pictures definitely didn't show how low the ceiling was and it forced us to rearrange our pre-planned sleeping arrangements last minute. The shower downstairs was reminiscent of one in an RV. We were also extremely disappointed with the back yard. We were looking forward to using it since the house got so hot during the day and it was shaded all the time. Unfortunately it was so dirty and spider infested that it pretty much was unusable the entire trip. The walk across dirt and gravel combined with the forest of spiderwebs made the hot tub fairly unusable as well. It was like a safari just to take the trash out on the side of the house. The bed in the upstairs bedroom was also a pretty cheap IKEA bed. Almost every night we had to fix the slats underneath the mattress. This, combined with the squeaks the bed made every time one of us moved made for some pretty sleepless nights. The price and location of this house, along with the front patio and kitchen definitely boosted our star rating but we won't be staying here next year. Close to town great shaded yard and hot tub. I went here with a couple of co-workers. But I want to plan a family vacation with friends. This place would be great for two families or one big family. Great place to stay! "We had a marvelous time! " We had a marvelous time! Communication with Russian River Getaways was great. They answered all our questions, were incredibly friendly, and available. 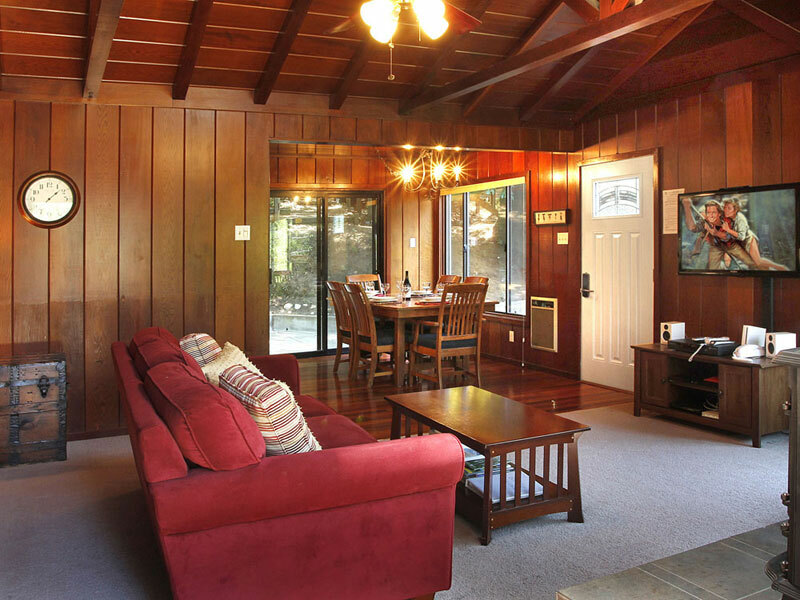 Central location within walking distance of the main strip in Guerneville. Really spacious place! The outdoor patio was great to grill and dine outside. Linens & bedding need to be replaced. Carpets were stained/dirty. The downstairs & outside bedroom was musty. The whole place needs a good cleaning and some TLC. Great location and grear area. Our family spent Thanksgiving week at the house: grandparents, parents, 2 children and a baby. The house was clean and well-stocked. It was roomy enough with one bedroom on the main level for the grandparents, a separate cottage bedroom across the deck for the parents and a very big basement room with a trundle bed and another twin bed plus a futon. The kids enjoyed playing in this room that also had its own TV and a shelf full of books and some games. The living room was cozy with a wood-burning stove, big windows, comfy sofa and chairs and a big screen TV. The modern kitchen was well-stocked, and the gas stove and dishwasher worked well - a must for Thanksgiving dinner! The weather was warm enough to use the hot tub, which was up some steps from the deck making it feel like it was in the trees. The outside decks could have used some sweeping as there were some leaves and debris around. The location was excellent: a Redwood State Park with hiking trails as well as vineyards are very close-by, the Coast is 20 minutes away, and you can walk into Guerneville where there are a number of restaurants and stores including a supermarket. There is a playground down the street for the kids. Unfortunately the miniature golf was closed for the season as was the beach area on the river. The owner provided a binder with all the pertinent information for running the house - we had no issues at all with appliances, heat, etc. Everything worked well. The only thing we weren't thrilled with is that the basement room uses a plug-in electric heater. It kept the room warm, but it can be a concern with little children. Outside the room is the laundry area which is not heated. The only other thing that could be a problem to some is that there is a double flight of stairs from the street level to the front door. Overall, we enjoyed this home and would recommend it. "It was an amazing place to stay"
It was an amazing place to stay. Easy to locate, neighborhood is amazing, supplies as indicated in the listing. Everybody had a great time. Thank u for sharing your home. We all feel sad leaving the place, lol, it was already part of us. This airbnb rental would be best for a couple or a family but we wouldn't recommend it for two families. 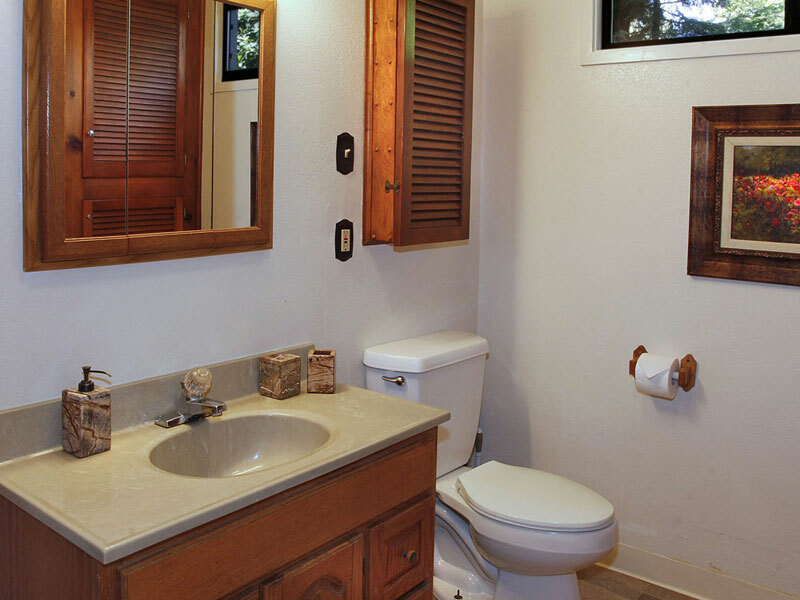 There really is only one bedroom suitable for adults with a bathroom. The other bedroom suitable for an adult is their "satellite" room which is detached. If you need to get into the main house to use the bathroom or get your kid that might be sleeping elsewhere in the middle of the night, it is rather inconvenient. The downstairs bedroom is set up for kids but is as they mention down steep and windy stairs, so it's kind of a catch for kids. We happen to arrive as the weather was cooling down and since there is no heat in the downstairs, it was very cold for those who had to sleep down there! PROS: Great location in Guerneville, hot tub was nice and warm, wood burning stove, they accommodated our request for pack n plays with no charge! CONS: While the kitchen is stocked with some cooking items, there were basic things missing like sugar and enough paper towels which an airbnb should have. It didn't have that "cozy cabin feel" because there isn't central heating, there are wall heaters that you have to manually turn on and off in addition to some not working, so after being out all day and leaving the heaters off, we came home to a cold house. There are many cobwebs that also made the house feel cold and not cozy. They do not provide wood for the wood burning stove! They do not provide towels for the hot tub and only gave us 5 bath towels for 4 adults and 2 children. We've stayed in dozens of airbnbs and are airbnb hosts ourselves. For the price we paid, we did not feel this was a good value for what you get. The place was comfortable and clean, the morning light beautiful, and the hot tub was a great bonus. "Bluejay Hideaway was an awesome experience"
"Great week spent at the Blue Jay!" Had a wonderful time spending some great quality time with the family at the Blue Jay. The location is wonderful for those with small children; there's a park, a pee wee golf just down the street. The kitchen upgrades are fantastic and the hot tub topped it off. Only bummer was that the dishwasher was broken from the previous tenants and we had to wash the dishes by hand. "We had a fantastic time at the house"
We had a fantastic time at the house. It's perfectly located right near the river, a few minutes walk from town and even has a park down the street which was great for our 8 month old. The house was super comfortable and had everything we needed including a pack n play and a high chair. The views are lovely too. And the whole process was very easy with River Getaways. They provided a ton of info, directions, instructions, etc. We didn't need to get in touch beyond the booking confirmation, it was so comprehensive. "Good location, not so good beds!" The staff was extremely nice and accommodating. The location was great! However the bed in the master bedroom seriously needs to be replaced. We enjoyed our stay and had a good time. FYI there are so many rules at this location. If I had read them all, I would not have gotten out of the house. Each rule came with a threat if it wasn't followed. Example- if you overflow the hot tub you will be charged. I just treated the house as if it were mine and didn't take time to read. The pages of rules. Blue Jay Hideaway was great. 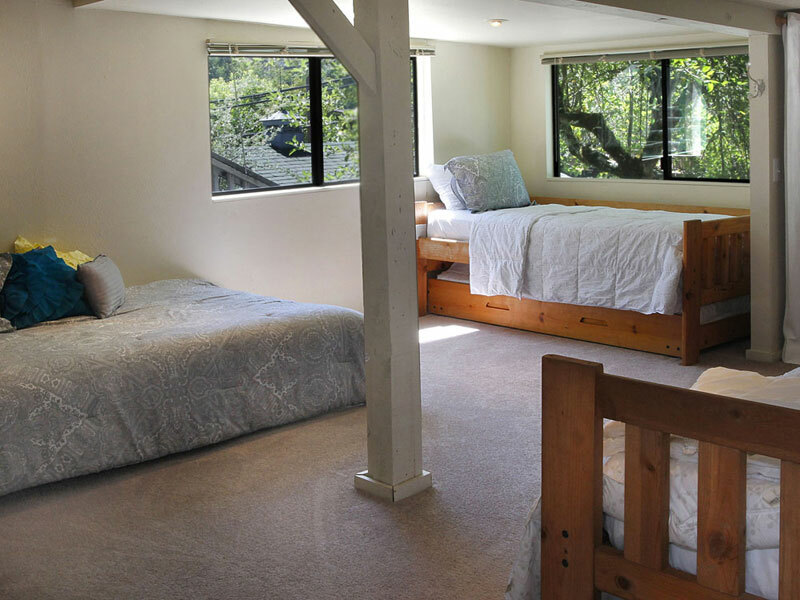 The space was comfortable and spacious, the amenities were enjoyable especially the hot tub, and it's at a very convenient location walking distance from central Guerneville and Johnson's Beach. 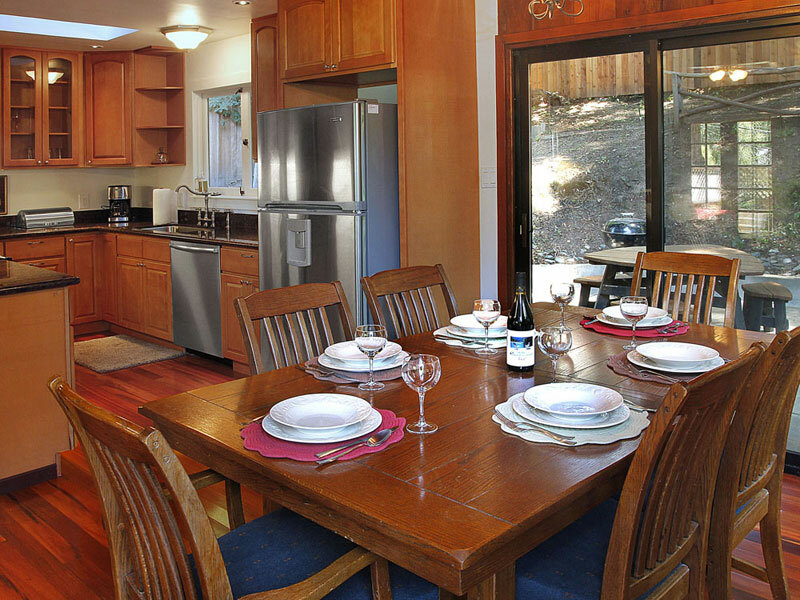 The entire staff of Russian River Getaways are accommodating, warm and extremely professional. All the information - maps, directions, house amenities and instructions were easily laid out and the lodge was in outstanding condition and working order. What a beautiful location - serene, close to town and so convenient. Naomi, Nathan, Matt and Rachel were all on hand to make my experience wonderful. Thanks again and I definitely recommend this spot! Was in the area with some friends for the weekend, house worked out great! Cute house in a great setting, loved the multiple decks. There's an additional futon with the room with the other beds as well, so additional sleeping space of someone doesn't feel like sleeping in the secondary unit that is off the house. Overall great experience! 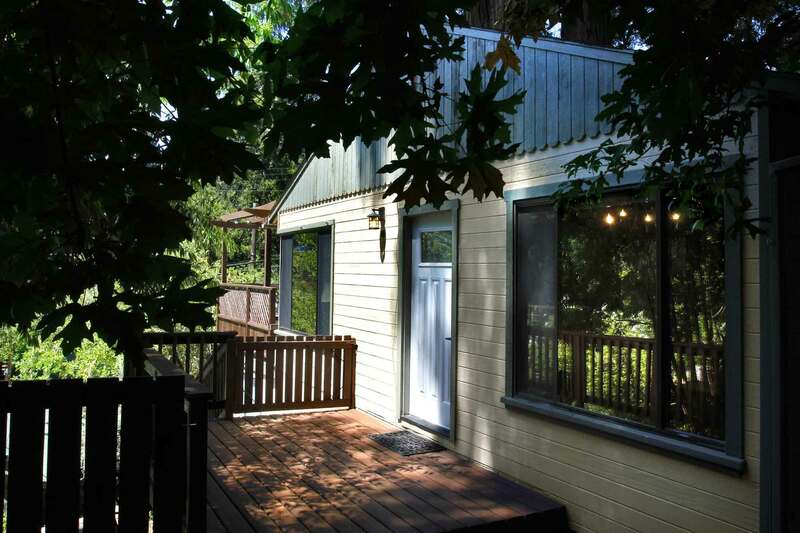 This cute woodsy home had plenty of space for our six adult guests. The yard was fully fenced and fairly private, with space for our pup to roam around, and beautiful Redwoods towering overhead. The hot tub was nice & hot and perched on a deck under overhanging Redwood branches. Not super isolated -- you can see the neighbors in every direction, but the trees and fences provide decent privacy. The kitchen was fully stocked for meal-making of all kinds. Even included a KitchenAid mixer! River Getaways was very easy to work with. They had to switch our reserved home last minute because of a broken hot tub, but BLUE JAY was a great alternative to our original choice and River Getaways made the switch without any trouble on our end. Overall I really enjoyed my stay at the Blue Jay Hideaway - the place was lovely, clean, beds were comfortable, and the hot tub was enjoyable. Short walk into town (5 mins) and to the beach as well. The water was very low however, perhaps due to the drought so no real swimming and enjoying of the river. We did have 2 issues with the stay. One - the downstairs toilet was backed up when we first arrived and basically out of use for our entire stay. We called the office and they did send someone to check it but were unable to fix it. The communication between the rental office - Russian River Getaways and us was sort of poor. They never informed us that they couldn't fix it so we didn't know they had come by. We also weren't sure why they couldn't call a plumber. They also didn't offer any sort of compensation for this (some $ off the rental, credit, or anything) which I found surprising since we arrived with only the upstairs toilet working. We were 6 people so only having one toilet was not ideal but we made it work. Not sure still why the rental office didn't compensate or communicate well with us about the broken toilet. Communication before our stay and the booking of our stay had been easy. The other issue was that the netflix on the TV didn't work. Also the TV package is only basic cable. We wanted to watch a ball game and were unable too. So if you are planning on coming and catching some sports games realize that unless its local you may be out of luck. The check out time is 11 am which is kind of early for packing up a house. Minus the toilet and the net flix not working, we had a lovely stay. I would definitely recommend the house, but perhaps not the rental company. The property was nice , and clean inside .Alot a value for the price.We went in June weather was hot !The ceiling fans in living room and bed room did not work propely and repairs or isssues wouldnt get done on our stay-Hot tub worked well and was clean.Noise level from area was low very quite no issues-short walk into town,Stairs going up are steep ,but wide .Down stairs rooms very steep and narrow good for kids and youths.Overall it was a good stay-Only one local store Safeway nightmare to get in and out go early! no staff -long lines. It was a perfect location within walking distance to town. The house was wonderful and everything you would expect from a river house. We really enjoyed the modern updates and the hot tub. The view from the house was great, but we were not able to enjoy it from inside the house because all of the blinds were broken and would not go up. My one recommendation is to get all of the blinds repaired. So this is a house that I would purchase to live in! So accommodating and perfect for three different couples. There is a private cottage, a downstairs "suite" and an upstairs bed/bath that was perfect for all of us and provided much needed privacy. We all agreed that we would fight over this property if it were to come on the market. The backyard was amazing and fully equipped with a hot tub. The house was in pristine condition, not a spec of dust in sight. The river was a super close walk and the town was the same. I highly recommend this house for any type of vacation. One caveat is that the rules are pretty strict, e.g. if you leave a belonging you have to pay a fine to retrieve it. With that being said it was a 5star experience! Yay Guernville! "a cozy but dirty vacstion house"
"great cabin with all amenities ,short walk to Guernville and riv"
"Wonderful getaway cottage in a charming town!" I rented this cottage during New Years 2012/2013 and really enjoyed it. 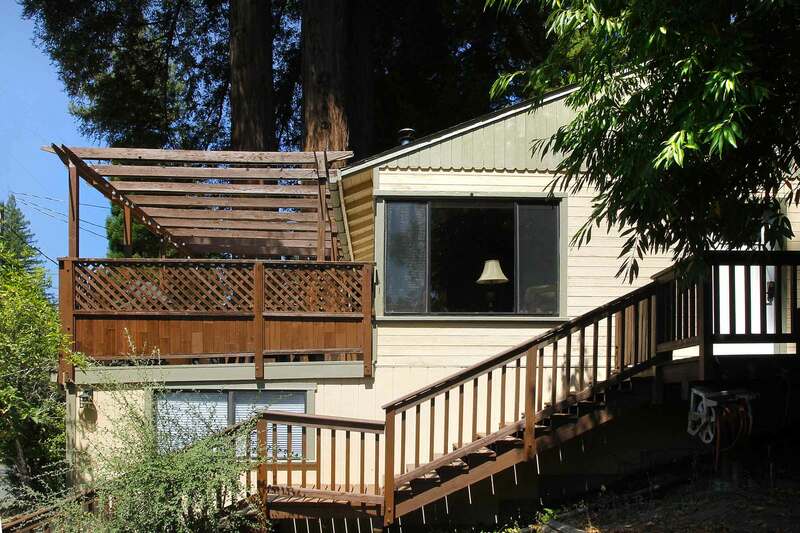 It's in a nice area, with a jacuzzi, surrounded by redwoods. I like that you can bring dogs. The rental company was very organized. The town of guerneville is very charming, I had never been there before. The house is in walking distance to the town, so you can go to bars, etc. and walk back home. Overall, I enjoyed my experience very much and was pleased with the house and it's affordability.The only small things that were less than ideal were that one of the rooms is detached from the main house and doesn't have a bathroom, so if you have to go to the bathroom in the middle of the night you have to go outside to get to the main house. It's just steps from the main house, but if it's winter and the middle of the night, it can be a little disorienting. The detached room can get a little cold in the winter, but they provide a small, but powerful space heater. The walk into town takes about 5-10 minutes, but be sure to walk with a group because the bridge over the river into town is a little sketchy at night, there's a few homeless people camped out there. "Relaxing - Close to town"
Stayed here for the 2012 Jazz/Blues Festival. Very comfortable, walking distance to Johnson's Beach and town.Do not recommed for someone with disabilities, as there is alot of stairs to climb to the front door.Otherwise a very nice relaxing comfortable home.Only one thing that was alittle gross was the shower curtain liner was very dirty. "Up close with the redwoods"
This comfortable small house on a quiet street is very private, thanks to the fine redwoods all around. We were pleased to be visited by a bluejay. In late September, temperatures were falling a little and the woodstove performed well. Firewood is easy to buy in Guerneville. The downstairs bedroom was a little cool, but that might be a huge advantage in typical summer weather. The folding crib was fine for our just-two-year-old.The kitchen is perfect, and very well-equipped. The main house was nice and roomy for five of us. We found several great beaches on the Russian River, and especially enjoyed the brilliant play equipment at the playground across the street. 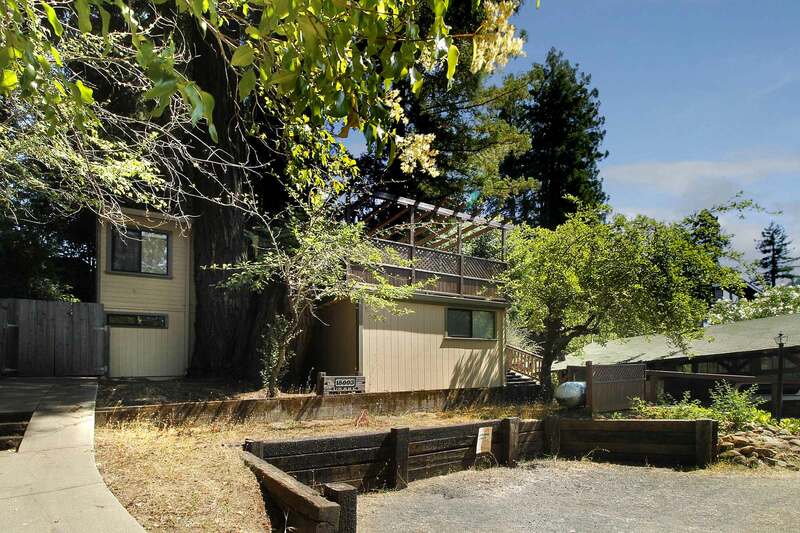 Great home in a great location, walking distance to the river and town,very comfortable, clean, updated kitchen and plenty of outdoor spaces.I would highly recommend this home for a group looking to enjoy the Russian River and have a nice relaxing weekend.